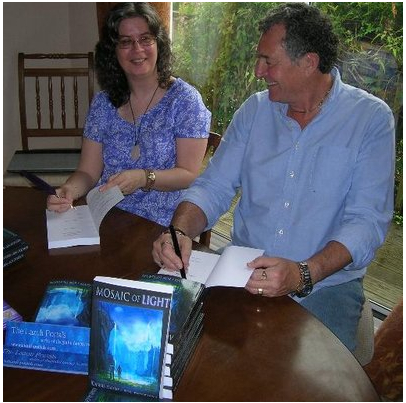 Though not a couple in the romantic sense, Joanna Gawn and Ron Dickerson write novels, short stories, flash fiction, and poetry together (through the pen name The Lazuli Portals) and definitely share what we consider a "soul connection." The core themes woven through their novels are spiritual awakening, synchronicities, crystals, friendship, developing intuition, and the incredible power of universal energy and unconditional love. They also explore other related areas of the paranormal. Ron: Jo became a partner, then wife, of a long-term friend, known through the MG Owners Club. I think we first met at a camping rally and got talking when Jo was not feeling too well. We discussed 'healing' (the only word I had then) and I offered support. Unique, well yes. Walt (Jo's husband) knew of my... shall we say ‘flirtatious’ manner. However, having a woman as a friend has allowed me to find new areas of me that were probably hidden, made me more open? Jo: I’ve always sensed very early on when a relationship is going to be important to me (including the one with my husband!) but in this case I was a bit wary. The sense of connection, of already having known one another for years (rather than minutes), was both overpowering and confusing – at least for me! Do you feel that you're connected on a soul level? Ron: Soul: now I have thought long and hard about my understanding of that word. Between a symbiosis of a continual energy force and a body, through to a religious connotation, and on to an entity created by self-awareness. So I cannot really answer, because I do not fully understand the term. But we accepted each other from day one and trust each other. There is a connection beyond that of ‘normal’ which allows us both to be very happily married to our partners and maintain a strong working and 'emotional' connection. Jo: Absolutely. On a personal level we’re best friends, while on a professional level we’re writing and business partners. I don’t really know how to describe our soul connection beyond that, except to say that there’s an instinctive understanding that it’s ‘right’, valuable, and worth protecting. We invest in it, work at it, take care of it. What is one of the most meaningful experiences you've had together? Ron: Probably discussing our varying understandings of Redfield's book The Celestine Prophecy; it really led to everything else, including our own books! Jo: Yes, the shared journey of reading and discussing The Celestine Prophecy, and its sequels. Learning about energy, synchronicity, control dramas, and unconditional love (like the acceptance and love we offer family and pets) has been life-changing. These have been core themes in our own novels. That learning continues, of course (therefore so will the novels!). Jo: Our very different life experiences and approaches have made for some interesting “discussions” (!) and also some powerful energetic shifts on a personal level. Our connection also includes a lot of mutual support, and fun. Ron: To wind each other up with no recrimination? Sorry – it must be to get our ideas into our books, and read and hopefully used to empower. Jo: That’s a definitive Yes! Synchronicity brought us to that car rally, and Ron’s healing support deepened my budding interest in subtle energies. Initially this led to my first Reiki attunement, then later I started my own business focusing on serving others with Reiki and energy healing. It changed my life – and would soon offer me a soul-driven direction for my writing. What challenge have you faced together? Ron: Just together and remaining very good friends is challenging enough! Jo: I agree! Being best friends and business partners is a double challenge in itself, but when that business involves a creative process as well, then there is definitely some potential for ‘difficulty’! That’s where the foundation of ‘unconditional acceptance’ (what some would label ‘unconditional love’) becomes so important. It gives you the confidence to be fully open and honest with one another, and to work through all the issues that inevitably arise, knowing that you’ll weather the storm and come out smiling. What are you each learning from your relationship right now? Ron: That learning never stops?! What advice can you offer other others who work or have a business together? Ron: Find your own balance, trust and be open. Jo: Good advice – and those can all take time. There may be bumps along the way, but have faith in your connection and your purpose, and you’ll keep making progress, and hopefully continue to serve and empower others as you do. Is there anything else about your relationship that you'd like to share with us? Ron: Really just how much we appreciate Walter's and Maureen's (our spouses) understanding in giving us the time they do. Jo: So very true. We couldn’t write and publish what we do without their understanding and support. Thanks, Walt and Mo! 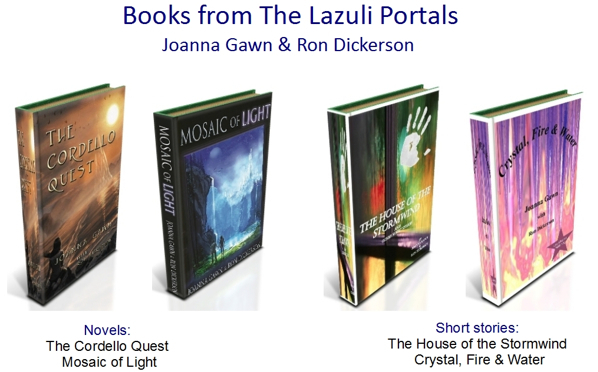 Learn more about The Lazuli Portals through their website, blog, Amazon, and Twitter. Download their free ebook Crystal, Fire and Water. Thank you, Jo and Ron, for sharing your friendship with us! 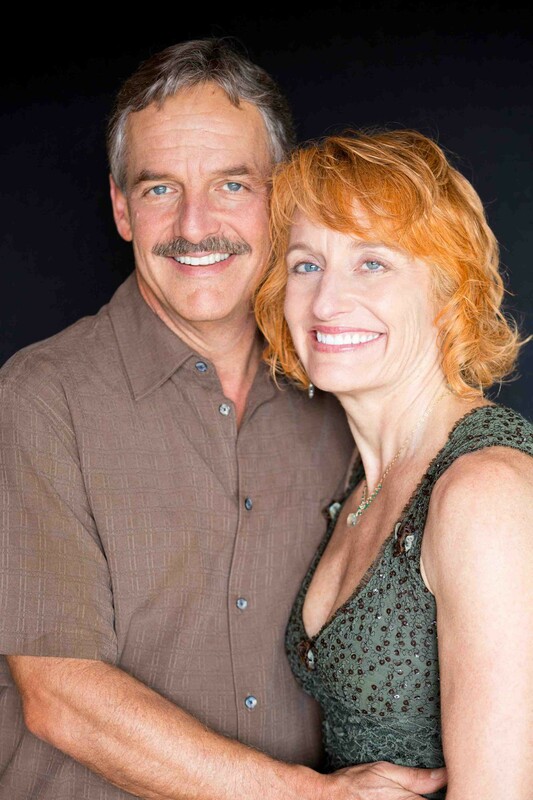 ~Mali & Joe, authors of The Soulmate Experience, 52 Prescriptions for Happiness, and the upcoming book The Soulmate Lover, and creators of Mantras for Making Love.